Suffering to flash your smile with confidence or your inability to eat your favourite foods? Welcome to your Ultimate Guide to All on 4 dental implant in Toronto! For patients with ‘bad’ teeth – teeth that are decayed, missing, or unstable due to infection, gum disease, poor nutrition, insufficient oral hygiene, use of medications, genetics, or a host of other reasons – the question may not be whether to take action, but rather what is the best action to take. Living with gaps in your smile might be okay for little kids, but not for grown-ups! Apart from the aesthetics, compromised teeth can lead to difficulty speaking and chewing, and even negatively impact your overall health. Fortunately, advances in dental health and dental technology have given us multiple solutions to our common tooth problems. One such solution has emerged as a leading treatment for people with missing or damaged teeth, helping thousands of Canadians to regain their healthy smile: The All-on-4 dental implant treatment technique. 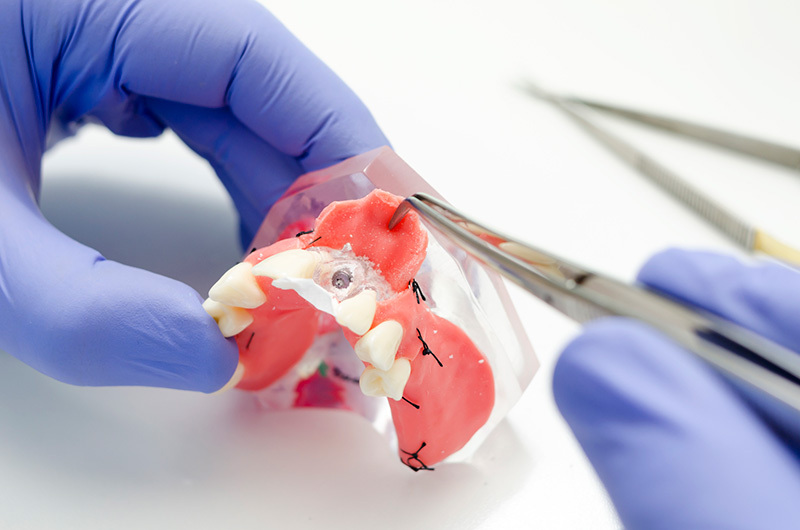 In this guide, you’ll learn more about all-on-four denture implants: what they are, how they work, who they work best for, how much they cost, potential areas of concern with the all on four concepts, and finally, how and where to get all-on-four dental implants in Toronto. If you have struggled with daily activities like eating and speaking with conventional dentures or are embarrassed to smile lest someone see the spaces in your smile, please read on to find out how this technique could deliver a vast improvement in your quality of life. All-on-4 is a registered trademark of Nobel Biocare, the company that funded the development of this revolutionary prosthodontics procedure twenty years ago. In technical terms, the all on four technique consists of placing four implants in the maxilla and/or four implants in the mandible, then attaching a fixed prosthesis that contains at least 12 teeth onto the four implants. In layman’s terms, it’s a full set of upper or lower teeth, affixed permanently (removable only by your dentist) to four titanium posts that are surgically implanted into your jaw bone on a slanted angle, where they will fuse with the bone just like the roots of your real teeth once did. If you have been diagnosed as edentulous – meaning you have, or soon will have, few or no remaining teeth – All on Four may provide a revolutionary answer. There are several key features of this procedure that are remarkable. 1. The teeth can be placed immediately, on the day of surgery. With some dental implant procedures, there is a lot of waiting time while the implanted posts heal; your gums grow over the posts, and then a second surgery is necessary to open the gums again so the teeth can be affixed – and that’s for patients who don’t require additional surgeries to open up the sinuses or augment their existing bone. With All-on-Four surgery, temporary, but fully functioning and realistic-looking teeth are placed during the one and only surgical procedure required. Then after complete healing, impressions are taken based on the new contours of the mouth and permanent, highest quality replacement teeth are affixed to the implanted posts in place of the temporary set. 2. All on 4 works well even for patients who have a significant bone loss in the jaw. Prior to this invention, such patients would not have been good candidates for vertically implanted false teeth without first reconstructing their jawbones with painful bone grafting surgeries that could take a great deal of time to heal and add up to tens of thousands of dollars, because often such surgeries are considered cosmetic in nature and aren’t covered by dental insurance. 3. All-on-4 tends to be less expensive than traditional screw-retained dental implants because there is only one surgery involved and only four posts, as opposed to individual teeth being crafted and then supported by individual posts. 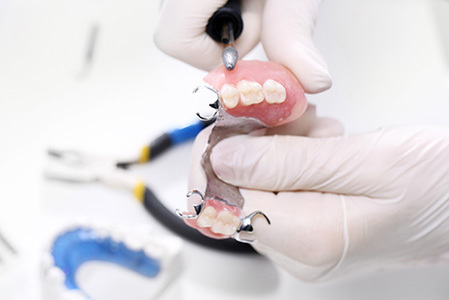 Am I a Good Candidate for All-on-4 Denture Implants? 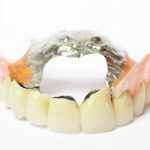 While only your denturist or oral surgeon can say for certain whether you would be a good candidate for the all-on-four treatment concept, the fact is that many people who wouldn’t otherwise be able to get permanently implanted dentures are indeed good candidates, because they do have enough viable bone to support just four implants. To further explain this concept, think of your jawbone like a muscle. If you don’t use it, you lose it…and if your teeth are damaged or decayed, you’re not using that jawbone anymore to anchor healthy teeth. Without strong roots to hold the jaw bone stable, your jaw bone begins to slowly atrophy, shrink and waste away. The same is true if your teeth are extracted and you have been living with full upper and/or lower dentures: in fact, bone loss is actually hastened by the pressure of a denture pressing against the bone, but not anchoring within the bone. Titanium implants, such as the posts used in the All-on-4 surgery, actually fuse with your bone (rather than just sitting passively inside the jaw) once full healing has taken place. In this way, they act like anchors, just as your natural teeth would. So the All-on-4 technique actually helps prevent future loss of jaw bone tissue even as it provides a stable anchor for your beautiful new replacement teeth. To find out if you are a good candidate for All on Four, your dentist will carefully analyze your bone structure, usually with a CBCT scan (a type of three dimensional X-ray)and use specialized dentistry software to plan where the implants could best be placed should you go forward with the surgery. And, of course, he or she will speak to you with regards to how you are currently doing with respect to your teeth. How satisfied are you with your current natural or replacement teeth? How are your daily functions, your speech, your self-esteem when you look at yourself in a mirror or find yourself in social situations? Because implant retained dentures can substantially improve these key factors for most people, based on your answers, you might decide to go ahead with All-on-Four dentures. Because the all on four technique is minimally invasive compared to other types of dental implants and provides a full arch restoration in a single surgery, the satisfaction rates are understandably high among patients who have had the procedure. In fact, in one study of 250 All On Four patients, satisfaction rates soared as high as 95 percent. For most people, this makes it well worth the cost, which can often be broken down into manageable chunks with a dentist’s payment plan, or even potentially covered by some forms of dental insurance. The cost for labor, materials used to custom craft the replacement teeth, the surgery itself, and all the pre- and post-operative visits, can reach up to $24,000 depending upon the individual oral surgeon and dentist’s fees, and the city in which he or she operates. This makes the All-on-4 the least costly (as well as the least time consuming) treatment option compared with conventional implants. The other thing to consider is the cost of not choosing the All-on-Four technique. Conventional dental implants, whereby the implanted posts are straight rather than angled, usually require six to eight implants – and you can be sure that the fees increase with each additional implant. In fact, conventional implants can cost $35,000 or more. Then there is the option of choosing conventional dentures – the kind that sit on the gums, that you take out and soak in a glass of water each night. Though much less expensive than implants, there is another cost when choosing these false teeth: the cost of embarrassment as the dentures shift around or cause excess saliva, the cost of not being able to enjoy a full and varied diet, the cost of chemically based adhesives to help keep your teeth in place, and the cost to your self-esteem resulting from a prematurely aged appearance if you keep your dentures out for too long and your face begins to collapse inward. By contrast, All on Four alleviates much of the psychological and emotional stress associated with tooth loss and the accompanying feelings of lower self-regard that occur when you don’t like how you look anymore. 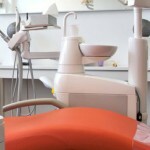 Why Doesn’t Everyone get the All-on-Four Dental Implant Procedure? If the all on four technique, whereby a full arch of teeth is placed on just four tilted implants, is so effective, why doesn’t everyone with missing teeth take advantage of this solution? Are there problems and concerns with the procedure? All types of oral surgery carry some acceptable risks, such as the risks associated with sedation, which are extremely minimal. There is a small percentage the implants will fail; for example, the body could reject them (which is extremely rare because titanium is highly biocompatible) or there could be protracted healing due to infection. As well, the experience of the surgeon comes into play, because All on Four is not being performed by everyone; some are more experienced than others and will deliver better results. As the all on four surgery has been performed thousands of times over the past two decades, there have been plenty of opportunities for research into the long-term success of the procedure. It has been found that the survival rate of the All-on-Four implants in the mandible was a stunning 99.2 percent after 10 years of follow up! 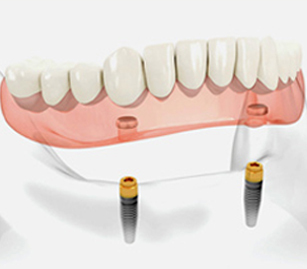 So, implant supported dentures using the All-on-Four method definitely stand the test of time. Because they are implanted directly into the jawbone, they act much like real teeth, which means that oral care is similar to that of real teeth (brushing and flossing), they allow for natural eating of a varied diet, and they support the facial structure for an improved appearance. The only barrier that typically prevents people from opting for All-on-Four (apart from people who are only missing a few teeth, and have healthy remaining teeth that can simply anchor partial dentures) is financial. For some people, especially those living on fixed incomes, the price is a definite factor. Fortunately, as dental technology improves and drives costs down, and as more and more oral surgeons begin to provide convenient payment plans or even partner with companies offering low-interest financing, more and more people are finding the All-on-4 solution within reach. Okay, I’m Ready to Try All-on-Four Dental Implants! Sign Me Up! 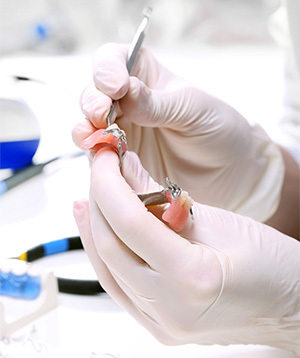 If you’re tired of your removable complete dentures – or of the facial wrinkles and caved-in look that have resulted from your unresolved tooth loss – your first step is to see your dentist, denturist, or oral surgeon ask for advice on what comes next. At Dentures Direct, we’ve performed hundreds of consultations for patients just like you, who are looking for answers to their dental problems. You don’t need a referral from your current dentist to come see a specialist at Dentures Direct. Simply call us to schedule a completely free consultation and to have all your questions about the All-on-Four denture implant solution answered. Our experience: We have performed countless full arch restorations using the highly successful All-on-4 technique. Our values: Our customer service is second to none. We have built our reputation on it. 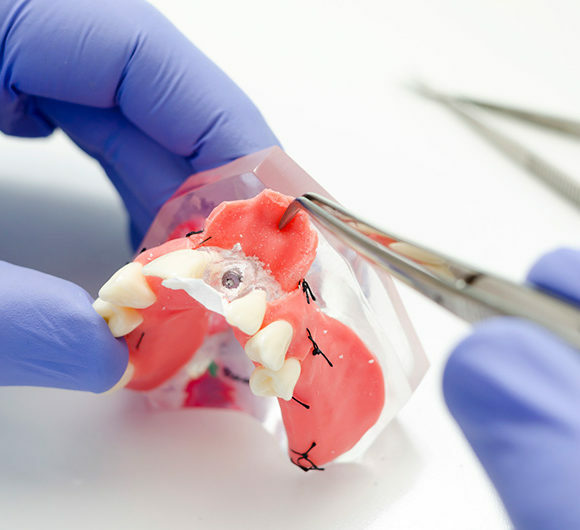 Our pricing: The on-site, state-of-art lab allows us to expertly custom craft your denture implants on site, using the highest quality materials, so you get a more stable tooth platform at a lower price. To find out more about the All on 4 procedure, its benefits, and to receive a precise cost quote tailored to your own needs and situation, just call Dentures Direct at 416-245-7474. One of our friendly staff will be pleased to book a no-obligation, hassle free consultation where you can come in and get the answers you seek – and maybe even improve on the gorgeous smile you had twenty years ago.